Yesterday was free comic book day. Honestly, I had never heard of it and when I found out about it, I thought it was just for my local comic book store. I quickly found out that it was a nation wide thing. With a little research I found that this day happens the first Saturday in May every year. Who knew?? I have never been big into comic books. I always thought they were just an easy read. Please don’t throw stones at me just yet. My views have changed recently. Since I lost my job in February I have ventured into the world of…well…the nerd. I have always been a nerd at heart. Really. I just never had the time to embrace my nerdness. I have been working since I finished high school. I have also gone to college and worked while in college. In high school I was too depressed to care. Now I find myself with free time, a lot of free time, time to do all the amazing things that I have ever wanted to do. Like watching anime. I loved Sailor Moon as a child, I knew it would be a breeze for me to get into anime and I was right. Not to mention I have always had a love for Japan…where anime comes from! I have also had time to get into gaming and will be uploading my first game play video on YouTube tomorrow. I am super excited about that. I have been into Doctor Who for maybe 2 years now, which seems to be a staple in the nerd world. Not to mention all the other movies and shows that I have been addicted to over the years. The world of the nerds has allowed me to not be ashamed of my love for Power Rangers and Disney movies. It’s where the adults who refuse to let go of the child inside. It’s a magical world and I have fallen down the rabbit hole. My last venture was comic books. A friend had told me about Free Comic Book Day and I was like…what? I knew I had to go check this out. I had to see what it was all about and I am so very grateful for the experience. Imagine a line of people excited for comic books. A line of people that love Doctor Who as much as you do. A line of people that still giggle at stupid kiddie jokes and enjoy the simple innocent things in life. That is what this day ended up being for me. And I got to share the experience with my mom and my brother. I have spent most of my life feeling like I didn’t belong. Yesterday I found somewhere that was crowded and I didn’t automatically want to fight everyone around me. Because these people around me were like me. 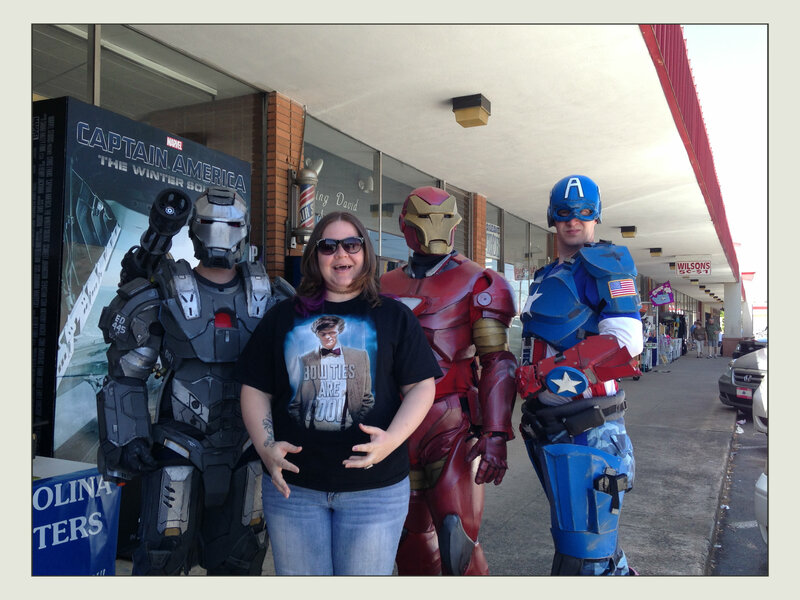 It was a fantastic day and I can’t wait for Free Comic Book Day next year! In two weeks Comicon comes to SC. Right in my hometown’s backyard. I can’t wait to meet more of these wonderful people. I am so excited that this is where the life of the unemployed has led me. It’s exciting. Now I just have to figure out how to make money with this new found nerd life! Thank you nerd world for waiting for me to wake up to your awesomeness! Yes! I agree! Sadly it will be a year before it comes around again. Sadness.